VBAC is an acronym which stands for Vaginal Birth After Cesarean. VBACs used to be relatively rare but they have recently been increasing in popularity. VBACs are an inherently risky procedure mostly because they involve a significantly increased risk of uterine rupture - a rare and extremely dangerous obstetrical complication. This page will explain what VBACs are, why they are becoming more common and how VBACs increase the risk of serious birth injuries. 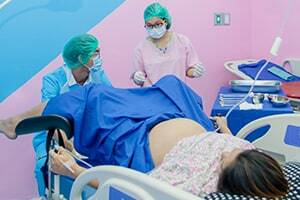 VBAC (vaginal birth after c-section) is the name for delivery of a baby vaginally after the mother delivered a previous baby via C-section. Once a woman has a C-section, any subsequent vaginal deliveries will be VBACs. The reason why vaginal deliveries after a prior C-section have a special name is mainly because they are considered a non-standard, higher-risk procedure. When a C-section delivery is performed, doctors make a surgical incision into the mother's abdomen and uterus. The baby is then delivered through this surgical opening. Afterwards the incision abdominal and uterine incision sites are stitched back together to allow them to heal, much like a cut or normal surgical incision. After the uterus fully heals following a C-section the woman's uterus will have scar tissue at the uterine incision site. The area of C-section scar tissue on the wall of the uterus is inherently weaker than normal, non-scarred uterine wall tissue. This lingering area of weakened scar-tissue on the wall of the mother's uterus following a C-section is the underlying reason why vaginal deliveries after a C-section are higher-risk procedures with their own acronym. Anytime a C-section delivery is performed, the mother is left with scar tissue on her uterus at the site of the healed C-section incision. This area of scarring is a weaker point on the wall of the uterus. This means that once a woman has a C-section if she gets pregnant again any attempt to deliver the next baby vaginally will be a higher risk VBAC. The primary risk presented by VBAC is uterine rupture. Uterine rupture is a rare obstetric complication which occurs when the wall of the mother's uterus suddenly tears or ruptures during pregnancy or childbirth. Sometimes the uterine tear is only partial and does completely go through the wall of the uterus. In more severe cases the uterine tear goes completely through the lining and wall of the uterus. Uterine rupture is one of the most dangerous of all childbirth complications. Whether full or partial, a rupture of the uterus presents an immediate danger to the baby. Once the uterus ruptures the supply of oxygen and nutrients to the baby can be severely restricted or even cut off entirely. Oxygen deprivation can quickly cause major brain injuries to the baby and result in devastating disabilities like cerebral palsy. When uterine rupture occurs it creates an obstetric emergency. There is no way to fix or treat a ruptured uterus. The only option is to immediately deliver the baby via emergency C-section, hopefully before any oxygen deprivation occurs. Normally, uterine rupture is an extremely rare pregnancy complication. Fewer than 1 out of every 1000 non-VBAC pregnancies are effected by uterine rupture. VBAC significantly increases the potential risk of this rare, dangerous complication. The reason for this higher risk of uterine rupture is simple. The scar tissue in the uterine wall from a previous C-section is always weaker than normal uterine wall tissue. The C-section scar site on the uterus is therefore much more susceptible to tearing and rupture when subjected to pressure during labor. Anytime a woman who has previously had a C-section attempts a vaginal delivery there is an inherent risk that the wall of her uterus will tear open at the C-section scar site. In light of the increased risk of uterine rupture, most doctors will not even attempt a VBAC unless the mother meets certain qualifications that classify her as "low-risk" for VBAC. Only around 20-30% of women who have had C-sections are classified as low-risk for VBACs in subsequent pregnancies. Even among these low-risk mothers, however, the VBAC failure rate is very high. Approximately 25% of low-risk VBACs fail. This means that 1 out of every 4 VBAC attempts is abandoned and the baby is ultimately delivered via emergency C-section. Who is Eligible for VBAC? Even if you meet all of these conditions to qualify as low-risk, your doctor may still be very reluctant to recommend or agree to a VBAC. Whenever a VBAC is attempted doctors should always take certain precautions and be prepared to intervene with an emergency C-section at the first sign of potential danger to the baby. The failure rate for VBACs is high. Even among low risk mothers a quarter of VBACs have to be abandoned. In most of these cases the VBAC will be abandoned before any uterine rupture occurs. Whether the uterus ruptures or not, however, an unsuccessful VBAC automatically increases the chances of a serious birth injury resulting from oxygen deprivation.